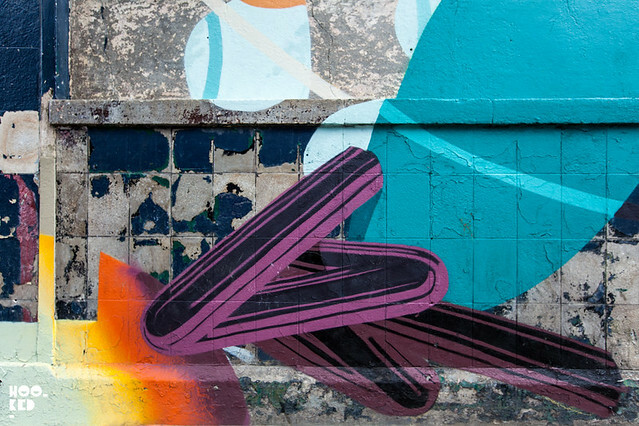 Building on their long running association with street art, Wahaca the UK specialists in Mexican street food once again team up with author/art curator Tristan Manco for their arts programme. 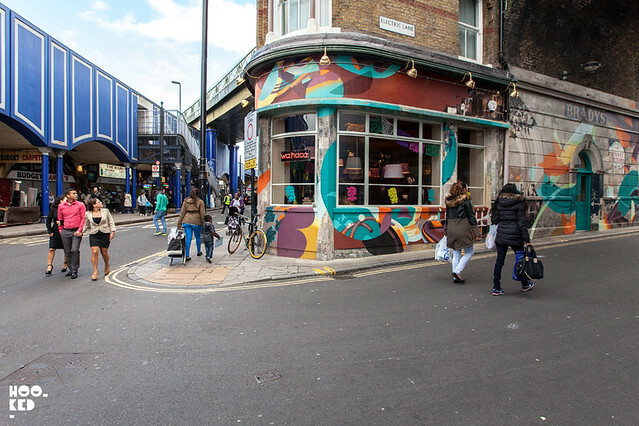 With each new restaurant Wahaca enlist Manco's help to select interesting street artists from around the world, matching the right artists to a particular space or project. We have previously featured the work of Mexican street artist Saner and French street artist REMED, who Manco selected back in 2012. The two artists decorated the exterior of Wahaca's pop-up space which was made up of 8 sea shipping containers perched on the terrace of the Queen Elizabeth Hall in the Southbank in London (covered here). For the most recent site Wahaca has revamped a unique building located in the heart of Brixton, on the corner of Electric Lane which has been empty for 12 years. 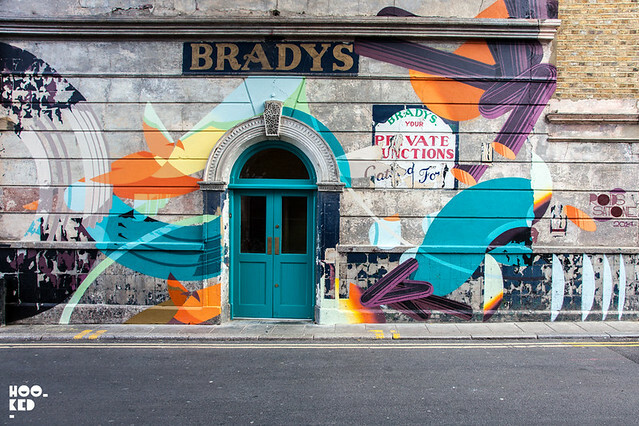 According to Manco the building "is much loved by the locals and was a former Railway hostelry and the site of the old Brady’s pub. Above the building run the overground lines and the surrounding area are the famous Brixton markets". 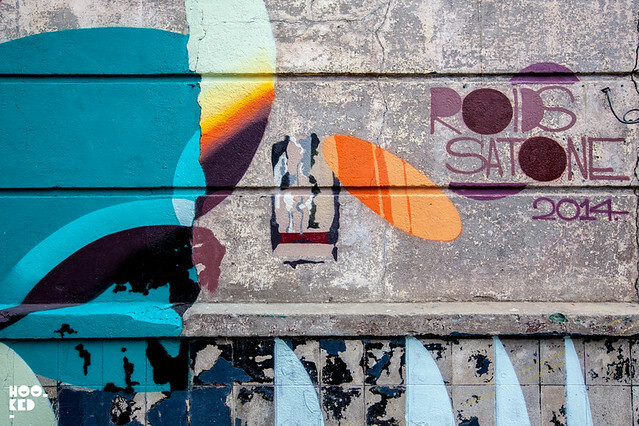 Acclaimed street artists Roid and SatOne were chosen for the project, collaborating together to create work that was sympathetic to the architecture of the building. Manco says, "rather than destroy the old layers of history our brief was to work with the exterior and interior surfaces we found. Having grown up in the area local artist Roid took inspiration from patterns such as the dutch wax african patterns sold in African material shops in the market. 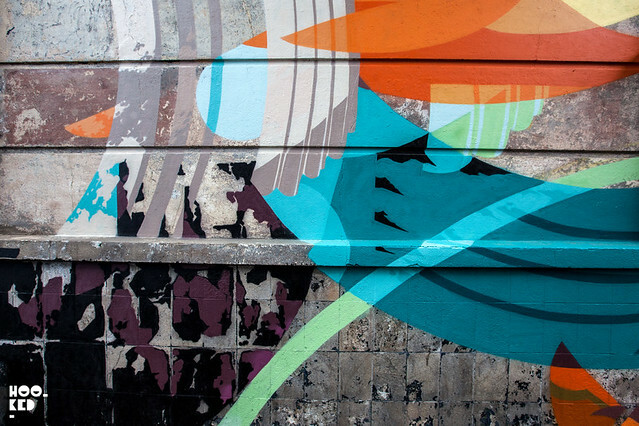 The respected German artist SatOne had collaborated numerous times with Roid before and seemed the perfect partner for the commission"
We ventured down south to the new Brixton space to capture some images of their new mural to share here with you here. Wahaca have also produced this video below which tells the story of the artwork from the two artists' perspective, check it out.